"I wish I could say your photos of what was the City Hospital brought back memories. But, although I spent six weeks in there as a patient, I can’t remember a thing. I was taken in, aged about 18 months, with diphtheria and put in isolation. Apparently, although my family weren’t allowed in to visit, the nurses used to take me to out to one of the upstairs balconies so they could see and wave to me. I’m told that the most memorable outcome was that I came back home with the ability to curse and swear like a trooper – something the older kids in the ward got blamed for. 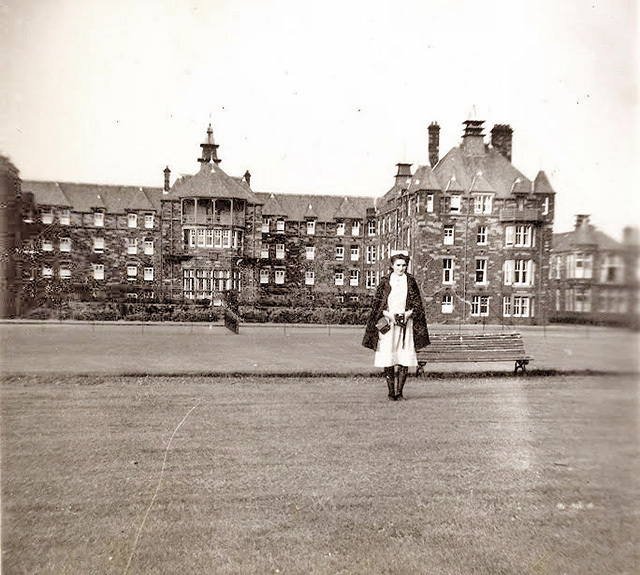 Thank you to Eileen Cameron for sending me a few photos of the City Hospital, Edinburgh, where she worked from 1948 to 1952. 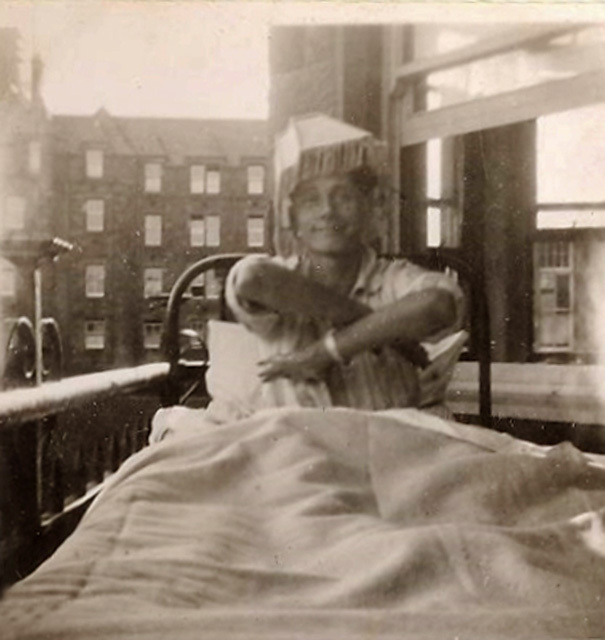 "Here are a few photos taken at The City Hospital, Edinburgh, around the time that I was a nurse there (1948-52). - I took Photos 1 and 2 below with my wee box camera. - Photos 3 and 4 below were taken by another nurse, a friend who was Swiss. She had a superior camera. I can't remember her name." The patient is in his bed on the ward balcony at the City Hospital. He is wearing on his head his occupational therapy lampshade. except a few prefabs (in the picture) and the Oxgangs estate (out of picture on the right). Thank you to Wilma Shaw who saw the comments about Photo 3 in Recollections 2 above and sent some further comments about it. "Oxgangs estates were not built at the time this photo was taken. - The houses to right are Colinton Mains housing group, possibly built by Gumley. - The fields beyond the prefabs became Oxgangs. The 'Fifty Housing Association' self build scheme was the first scheme. - This scheme was built to the right of the road seen leading through the fields in the centre to the wood near the top. - Home owners started moving in during 1953, as and when those houses were completed. - The wood is the 'Cockit Hat'. Beyond it, you catch a glimpse of the 'T Wood' up from Swanston. - The older properties on Oxgangs Road are leading the eye out of the picture at top left. - The wooded area in the centre is where today's Police Station is, but when this photo was it was a farm that used to be known to Robert Louis Stevenson. - The hedge-line along the foreground of the photo is bordering the present day burn. - his thanks to contributors to the EdinPhoto web site. - his memories of growing up in Portobello, before emigrating to Canada. "I recall when I was about 8 years old, give or take, through no fault but my own misadventure, I had one of my big toes partially severed by a siver. (It would be called a storm sewer grate, around these parts, and is found in the street gutters to strain out debris. I'm sure you know what I'm on about!)" "Anyway, I spent some time in hospital, but it seems to me, that it was a low lying structure perhaps one or two floors, possibly an addition, perhaps an annex. I remember the Ward Room where there where other young boys and girls, and the view from the window. It was right at the foot of the hills - much closer than the view from the City Hospital. For some reason, I think the hospital was close to Holyrood Palace, or backed onto Arthur's Seat. Do you have any thoughts on where that would have been? ** I as born at Elsie Inglis ( spell ) maternity hospital in 1953. Now a home for the aged as I recall." "In closing Peter, let me say once again how thankful I am for the effort you put into keeping the EdinPhoto web site alive. Over the years, it has been a door through the mist of time to my earliest and fondest memories. But, as I always said to my daughters when they where young, "Adversity builds character." That's my family motto, and your contributors certainly have been tempered by that too." "As I have gotten older - and, debatably, perhaps wiser - I realize that everyone has a story. Thank you for being the enabler. Even if no-one recalls our recollections, it's warming to have the opportunity to share them. No-one should be denied there past. That's what makes us relevant. All the names on your contributors list aren't just names, they are the neighbours. The late Jessie Newland lived in Revelstoke B.C. I never knew her, but I know she was one of the first female police officers in Edinburgh. As I pass that town on my way to Vancouver. I know that Jessie lived there, thanks to you. Writing this has made me home sick, and I know there is only one cure for that." 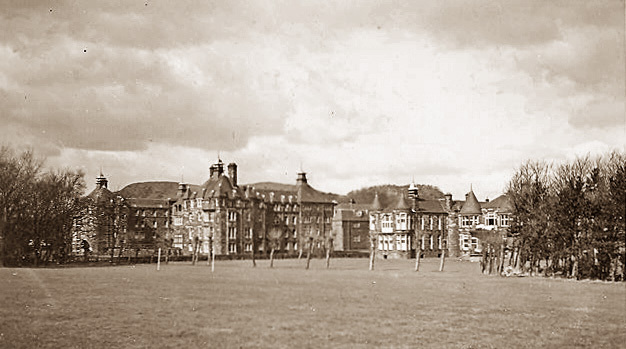 "The Deaconess Hospital at the top of Pleasance, St Leonards, was a children’s hospital. 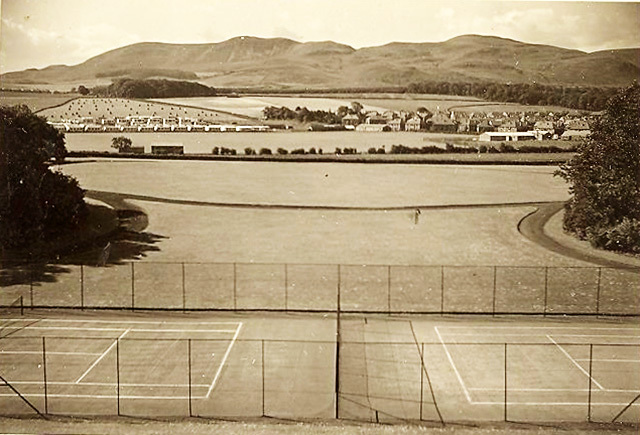 The Deaconess had wards that looked onto Arthur's Seat – could this be a possible for George? I spent many a time there being fixed up after various mishaps etc. when I was a child in that area!" Thank you, Mike, for your 'Deaconess Hospital' suggestion. In fact, I wondered if the 'Deaconess Hospital' might have been the hospital that George remembered, but I dismissed that idea because it did not seem to fit in with George's description of the hospital as being a 'low lying structure'. However, I was not aware that The Deaconess had been a children's hospital, and that certainly seems to be relevant.. I've now sent an email to George, to let him know about your suggestion. "I lived about 100 meters from the Deaconess Hospital, which was situated at the top of Brown Street next to the church on the Pleasance. It was indeed a Children's Hospital, or it had a Children's Ward. I spent many a weekend in there with injuries received from events in Holyrood Park, which was our playground. That was in the 1940s. I have great memories of that time!" "The Deaconess was the kids' first port of call for that area. There was also the Sick Kids' Hospital up at Sciennes. Yes, the Deaconess was where wewent to as a child to get our tonsils out - lots of ice cream to cool the pain! We went there as Out Patients to get their plaster casts fitted when we broke our arms, legs or ankles, r to be stitched up when we had cuts and bruises. My Dad was in the Deaconess for Scarlet Fever and Mumps. My recollection is that Elsie Inglis was a maternity hospital only. Can any contributors clarify that?